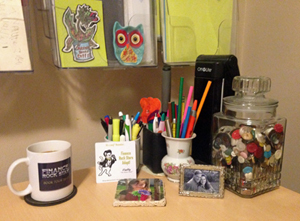 What's On My (Profitable) Desk? Your attitude drives your success. Stay positive to stay profitable. You’ve heard these business mantras many times before. Ok maybe not the last one… unless you’ve got my office bugged. Bottom line? Your attitude does affect your profit. What effects your attitude? Yes I know these pesky numbers people and their linear minds. Humor me (or push my laugh button and humor yourself). What effects your attitude? What is the single place you spend time consistently when working? This post is part of the Word Carnival extravaganza. This month’s topic: Behind the scenes of your business/blog. Click here to read posts from my insightful, fun, smart, and sometimes snarky colleagues. You might think, a desk is a desk. It holds my computer, paper, a beverage (coffee please! ), and some pens. What else do I need? Do you use salt? Pepper? Cinnamon? Sage? Nutmeg? No I haven’t lost my mind. It’s a real question. Do you eat food that’s bland, boring, yet nutritionally good for you? Not if you can help it. In fact you’ll avoid that bland, perhaps even bad tasting food at all costs, going straight for the best tasting stuff even if it has zero nutritional value (chocolate cheesecake sounds good even at 7 a.m.). Your subconscious sees your environment every minute of every day. Let’s deconstruct my desktop messages. Use them as prompts to thoughtfully decide what deserves a spot on your desk. FYI – normally these are spread out across my desk, I grouped them together for the picture. While I’m passionate about my work it doesn’t define my life. Having pictures of my husband and daughter on my desk helps me stay focused on why I work. Since becoming a parent I’ve discovered that my daughter provides a valuable litmus test. I now consider how she might view my actions as she grows older. Would she be proud? Disappointed? Inspired? On days where feelings of uncertainty, frustration, and depression run rampant I look at her picture and think about that message. I want to teach her to be a fighter, to follow her passion, to help others, and do the right thing. If I don’t lead by example how will she learn? The coffee plant drawing comes courtesy of Tori Deaux at Quirkipreneurs. Tori has been a valued colleague, creative cohort, and friend over the past few years. Her encouragement and advice was the genesis to embrace my quirks and break out of the corporate mold. I wouldn’t be writing for the Word Carnival today if she hadn’t encouraged me to write with my own voice. This card reminds me to be myself and that I’m not alone. The ceramic owl next to my coffee plant? Given to me by a client with a handwritten note thanking me for all my help. All the money in the world couldn’t buy the feeling when I received that gift. The owl serves as a reminder of why I do what I do. I help people. I make a difference. Of course my desk would not be complete without at least one mascot! 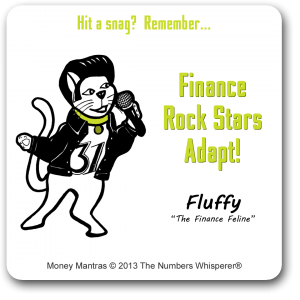 Fluffy the Finance Feline joins me every day on this Money Mantra Card. 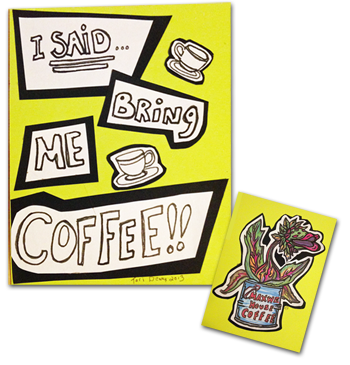 A desk without coffee is no desk of mine. There is always a mug of coffee on my desk. I find the scent alone helps me be comfortable yet energized. In this picture I’ve chosen a mug from the book launch for “How to be a Finance Rock Star“. A great reminder of what I’ve already accomplished and a spur to do even more. I debated whether or not to explain this jar. The story is quite personal. Yet it’s something I look at consciously every day. When I was a young kid, I remember my paternal grandmother had a jar of buttons. I was endlessly fascinated by this jar as the buttons were all shapes, sizes, and colors. My grandmother (a smart, independent, and loving woman who I still miss) would let me play with the buttons, but I could never take any. Looking back I realize that living through the depression she kept those buttons “just in case”. A few years ago my Dad and I were arguing about something. Somehow my childhood came into it. He had been remarking on something one of my sisters had been involved in briefly, yet couldn’t remember my similar, and more lengthy, involvement. I threw out that he hadn’t really paid as much attention to me, he couldn’t even remember this involvement. I was mad and hurt, and frankly behaving like a kid not an adult. Fast forward a week. A package arrives in the mail for me from my Dad. What the heck is this? I opened it up and inside was a jar of buttons with a simple note. I remember you always wanted a jar of buttons. Take 10 minutes and really look at your desk. What messages are you sending yourself? What messages do you want to be sending? Transform your space into one that supports profit in your business. I’d love to see pictures – feel free to share on Facebook or post on Pinterest and tag me. Are you ready to become profitable? To be successful and soar? Sign up for a free call with me to find out if this is your time to profit. Love this! And I’m so happy that my drawing has a place in your workspace! My own “quirkspace” is currently a wreck (mostly due to the evidence that I eat at the computer too often) but hiding behind the empty Diet Coke bottles are a ceramic tea pot shaped like a pig (a piggy bank reference) and a figurine of Mother Goose, writing her stories with a feather pen. Moolah the Cash Cow is also in my office, but not on my desk. Talking about my walls would take a whole novel! I know it’s daunting, however I hope you take the time for yourself soon to make room for you in your quirkspace. Love that story about your dad and the buttons. That got me right in the feels. I’ve got a nice large L-shaped desk with a horizontal file cabinet on both ends. In short, I’ve got a LOT of space to work with. It’s crazy, but I don’t keep pictures or chachkies there. Partly, because my desktop is a war zone most days. I’m only ever guaranteed to be able to find my keyboard, mouse and coffee mug. So, I put favorite gifts from clients on the bookcase where they’ll be safe. And try to keep the creative clutter to a dull roar. Thanks Tea, I’m pleased how it’s resonated with my readers. I’m the Goldilocks of desk decor. If my desk is too bare I feel over sanitized. If its too busy I feel unsettled. Just right and I’m on a roll. Nicole, that was the sweetest story about the buttons… totally got me all teary-eyed. I seem to remember my grandmother (and subsequently my mother) also had a jar and box of buttons. Thus I have always had a love affair with buttons. Somehow I managed to grow up and not have any (SAD!) but maybe I will start a collection. I do have ONE button, which used to be on my mom’s dress long ago and whenever she wore it I got all starry-eyed so to this day I keep it on my desk 🙂 You are so right that the things around you impact everything you think and do. Surround yourself with good stuff! Carol Lynn I think you need an Oreo button. Someone must make them, right? I think starting a button collection could be a great way to celebrate and remember both personal and professional success. You already have your mom’s button. Ok…my desk NOW is a laptop table that is working well. I have learned that I can function with less. I use to have a much larger desk that I did not really use most of that space productively anyway. BUT I still have room for my coffee so I too MUST have that nearby and my essentials are next to me. At least now with less space I am much neater! Reading everyone’s post is giving me ideas of putting more inspirational items near me…my newest to do! THANKS Nicole! You got us all with the buttons. I have a minute chest of drawers about 18″ high with a brass plaque on it and the name Rosalie. She was my great grandmother. She gave the drawers to my grandmother who collected buttons in one of them. She passed it on to me because as a child it was my favourite toy. When my grand-daughter’s life was imperilled during my daughter’s pregnancy, one of the things I envisioned to keep me sane was this little mite playing one day with the buttons. And now she will. Collections of buttons suddenly have a whole new meaning Nicole. Your father must love you a lot to have remembered and put that gift together. What a special treasure. Both! Okay, I’m glad I’m not the only one who teared up while reading about the jar of buttons story. I’m so glad you shared that! I loved learning about what’s on your desk and why. It’s so important to have things in our offices that remind us of why we’re doing this in the first place. I also loved the coffee plant drawing that reminds you you’re not alone. It was so nice getting a behind the scenes look at your workspace! The button jar is a good one. I stockpile cards that my wife has made for me (birthday, anniversary, whatever) — she makes each one by hand, so they each are unique and special. I also keep some various tchotchkes like star trek ships or firefly figures or gnome figurines (for my audio drama group: Giant Gnome Productions). But the most important thing of all in my office is probably my wall of praise. It’s all the thank you notes I’ve received over the years and each one goes on the wall of praise, so I can remember why I do what I do and who I do it for. Sometimes if I get a particularly good recommendation, I’ll print it out and stick it up there. Oh, and coffee – no end of coffee. The whole office reeks of coffee.